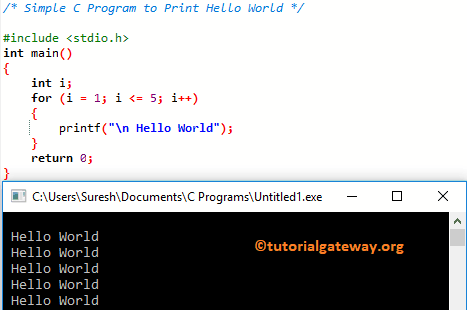 In this article, we will show you, How to write a sample C program to Print Hello World. This is the basic, and traditional program to start any programming language. It also helps you to understand the basic programming structure of C Programming. This sample C program will print the hello world. Within this Sample C Program to print hello world, First, we included the stdio.h, which is a standard input-output header file. This file allows you to use standard functions such as printf, and scanf. Following printf statement will print the message Hello World. In this C program, we are using the For Loop to print the same statement multiple times. You can also use While Loop, or Do While to get the same result. In this sample C program, we are using the Functions concept to print the message: Hello World.